Providence Players is casting six to eight (6-8) roles, three to four (3-4) men and three to four (3-4) women. No roles are precast, and all roles are open. All backgrounds, ages, ethnicities welcome and encouraged to attend! Monday, April 1st, 6:30 – 9:30 pm (In the James Lee Theater): Open Auditions. Wednesday, April 3rd, 6:30 – 9:30 pm (In the James Lee Urbanites Room): Open Auditions. PLEASE RSVP to info@providenceplayers.org with the date you plan to attend. There will not be a separate callback. Actors who audition on Monday may be asked to come back Wednesday, if available. You are not required to be available both nights to be considered. Auditions will be held in the theater on April 1st and in the Urbanites Room on April 3rd. Please come in the front of the community center and sign in at counter. Staff can point you in the right direction and signs will be posted. Julie Janson is an award-winning director. 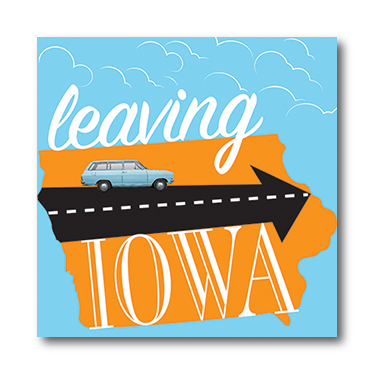 Leaving Iowa will be Julie’s third time directing with PPF: past shows include Amadeus (winner of 2016 Ruby Griffith Award for Outstanding Achievement in a Play) and Oleanna (2019). She has actively participated in more than 30 productions, on and off the stage, over the past 20 years. Her other directing credits include The Elephant Man by Bernard Pomerance (2012); Shadow Box by Michael Cristofer (2004); Black Comedy by Peter Shaffer (2004); and Reckless by Craig Lucas (2003). This is a small, ensemble cast, so every role really is a big role! The biggest thing I will be looking for in auditions is the actor’s ability to have fun and take risks. There are a lot of beautiful, subtle moments in this show, but there are just as many crazy, wacky scenes which will require actors to take chances and shamelessly have fun. Every role is this show will require significant transitions: Three of the four family members must be able to play a younger and older version of themselves and the 2-4 multi-role characters will be tasked with that ultimate challenge of creating multiple distinct, interesting characters. ALL ARE WELCOME! I repeat: ALL ARE WELCOME! I have NO pre-conceived notions about age, sexuality, ethnicity, etc. Below are the ages and some of the descriptors suggested by the playwright; however, no one should disqualify themselves based on this information. As a director, I believe first and foremost in creating an environment where both actors and crew feel inspired to challenge themselves and reach their maximum potential, all while having a collaborative, positive, fun experience which results in a theater family. As part of this family, you will work hard, but the outcome will be worth it. I truly believe this will be a special show. I hope you will join us on this journey. If you are unfamiliar with this show, the most accessible point of comparison is the Griswold Family of National Lampoon’s fame. DON BROWNING: Adult writer, young boy in flashbacks. Don is at the center of this story and rarely, if ever, leaves the stage. Actors considering auditioning for this role should be comfortable memorizing a large amount of dialogue and be able to convey an adult and teenage version of Don. DAD: Don’s father. A man who loves his family, life, and adventure. A constant presence throughout the play. While he may not always be talking, he’s always there. MOM: Don’s mother, past and present. A woman of saintly patience and strong love for her family. Must be able to play an adult and “older adult” version of her character. SIS: Don’s sister, past and present. That annoying sister you know and mostly love. Must be able to play an adult and teenage version of her character. This is an ensemble show. This means that most rehearsals will require the entire cast. I will be casting this show very quickly and actors should expect the first read-through to take place on Monday, April 8th. Actors should expect 3-4 rehearsals a week (generally 2-3 weeknights and one weekend rehearsal) through April and early May with more work as needed when we enter tech weeks. A copy of the preliminary stage rehearsal schedule is included with this announcement and will be available online and at auditions. The schedule will be finalized the week after casting and will be based on crew and actor conflicts. Unless indicated otherwise, all rehearsals will happen at the James Lee Community Center. Weeknight rehearsals will start at 7pm and will generally go until 9:45pm. Weekend rehearsals will be based on availability. HOW WE WORK: You are welcome to come to audition on more than one of the open audition evenings. This is not a requirement. Most PPF auditions have actors up and down to read multiple times in multiple combinations and scenes. Most actors find this fun. As space allows, you will be able to watch the auditions. You may be asked to go into the hallway with audition partners and work a bit on a scene. We will do our best to get you up multiple times reading for parts you are interested in. You will also be asked to read for other parts you may not be auditioning for. The Providence Players strives to make our productions open to interested and engaged actors & actresses, regardless of their level of experience. We try and make our auditions as relaxing and fun as possible. AUDITION PROCESS & SIDES: Auditions will consist of readings from the script. No monologue required although one of the sides may be a monologue from the play. Sides for the audition process will be supplied at auditions. AUDITION FORM: Resumes and headshots will be accepted, but are not required. Please ALSO COMPLETE the attached PPF Audition Form and bring it with you to the audition. We may ask to take a picture of you, but this is for internal use only and will not be shared. ← Scholarship Applications Now Being Accepted for College-Bound Seniors!